A huge blaze, falling debris, and people reportedly still trapped inside – terrifying footage of the inferno at the massive block in West London has emerged online. “The fire started happening on the third floor. We called the fire brigade. They came 20 minutes later. And then the whole thing just went off. An hour and a half later I saw a kid on the 22nd floor on fire. He went to the window and jumped,” Greg Stevens, an evacuee, told Ruptly news agency. Another video featured a figure in a window of the burning Grenfell Tower in the early hours of Wednesday morning. Another evacuee, Daniel Williams, described how fire brigades were battling the blaze. “They’ve come down, and they’ve tried to put the fire out but they weren’t reaching it… As the fire got higher, then they decided to use the ladders. But even then, the fire has just gone up. And now half of the building is gone,” he told Ruptly. As of early Wednesday morning, the building is still engulfed in flames. 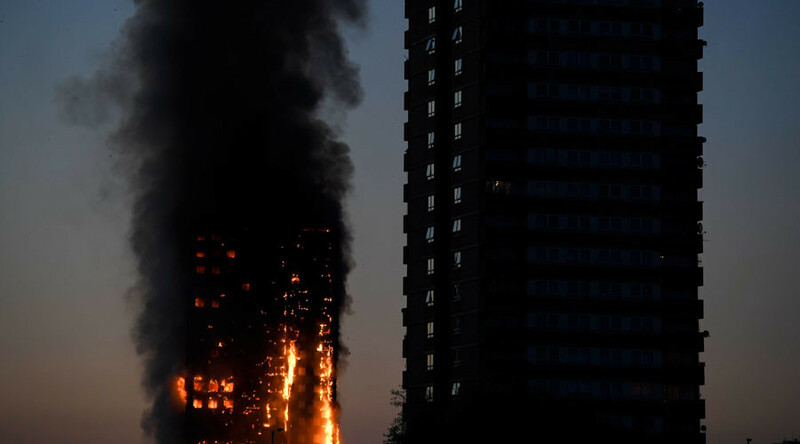 At least 45 fire engines and over 200 firefighters and officers have been deployed to the scene, the London Fire Brigade said. “Firefighters wearing breathing apparatuses are working extremely hard in very difficult conditions to tackle this fire. This is a large and very serious incident and we have deployed numerous resources and specialist appliances,” Assistant Commissioner Dan Daly said.